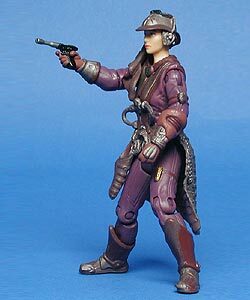 Comments: Zam Wesell is the dangerous, heavily armed bounty hunter mysteriously hired to eliminate Senator Amidala. Swift to action, Wesell is a refined, unrelenting assasin and an excellent tracker. Her quarry's almost nonexistent survival rate confirms Wesell's eminent reputation and unsurpassed markmanship. Wesell gets more than she bargained for when her assassination attempt is foiled by the Senator's Jedi protectors, who pursue the bounty hunter on a harrowing chase through the Coruscant skyline.